I wouldn’t normally describe a portable battery as being beautiful, but Kanex’s just-released $99 GoPower USB-C Portable Battery fits that description. Its aluminum body is like a mix of Apple’s space gray and silver colors, but it’ll look good when paired with any 12″ MacBook. Good looks are nice, but the real world performance of a battery pack is crucial. How does Kanex’s offering stack up? Check out our hands-on impressions. In all, the Kanex GoPower USB-C features three ports — two USB-C ports (one for charging the battery and one for charging devices) and a single USB-A port for charging smartphones and tablets. 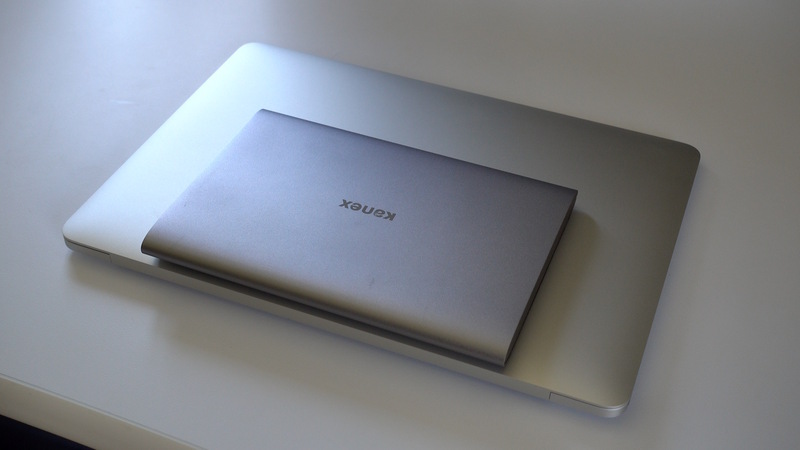 Thanks to its 15,000 mAh capacity battery, Kanex says that the GoPower USB-C can recharge a 12″ MacBook from 0 to 100% power. It’s also capable of charging an iPhone or Android smartphone multiple times over. The GoPower is even capable of charging two devices simultaneously by utilizing both its 3A USB-C port and 2.4A USB-A port at the same time. Keep in mind that such a big battery will require a significant amount of time to recharge. The USB-C input for recharging is a (5.0V x 2.4A) port that works with 12W charging adapters. 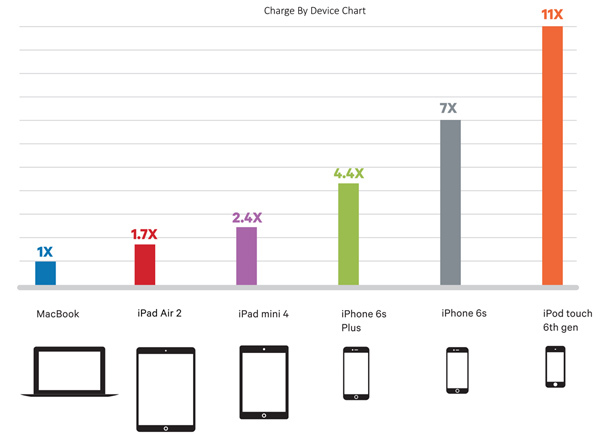 With this in mind, you could use a typical 12W iPad charger to recharge the device at the fastest rate. In real world tests, It took me somewhere around ~8 hours to fully recharge the GoPower USB-C from 0 to 100%. 12″ MacBook owners will primarily interface with the USB-C to USB-C charging cable that comes bundled with the battery pack. Kanex’s cable is of the braided variety, meaning it’s stiffer than a typical rubber cable, which helps it to resist tangles, but also means it’s a little less flexible. 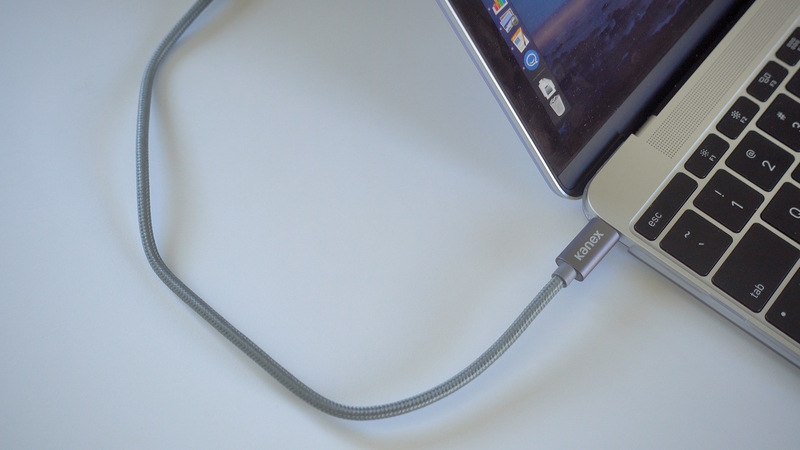 The charging cable can be used to charge your MacBook or other USB-C-enabled devices. The same cable can be used in concert with a USB-C power adapter, such as Apple’s own 29W USB-C adapter, to recharge the GoPower USB-C as well. Kanex doesn’t include a dedicated power adapter for its battery pack, so you’ll have to provide your own. Kanex has made it possible to charge both your MacBook and the GoPower USB-C battery by utilizing pass-thru charging. To use pass-thru charging, connect the battery to a power adapter via its charging port, and connect your MacBook to the battery via a separate USB-C cable. By doing so, your MacBook will charge first, followed by the battery pack. You can thus leave your MacBook and GoPower USB-C to charge overnight, knowing that you’ll have two fully charged devices by morning. The GoPower USB-C features four LED indicators and a power button next to its charging port. Each light represents 0-25%, 25-50%, and so on. When charging the battery, you’ll notice that the LED lights ascend, and when charging devices, you’ll see the lights descend. Users can press the power button at any time to see how much charge is left on the battery. 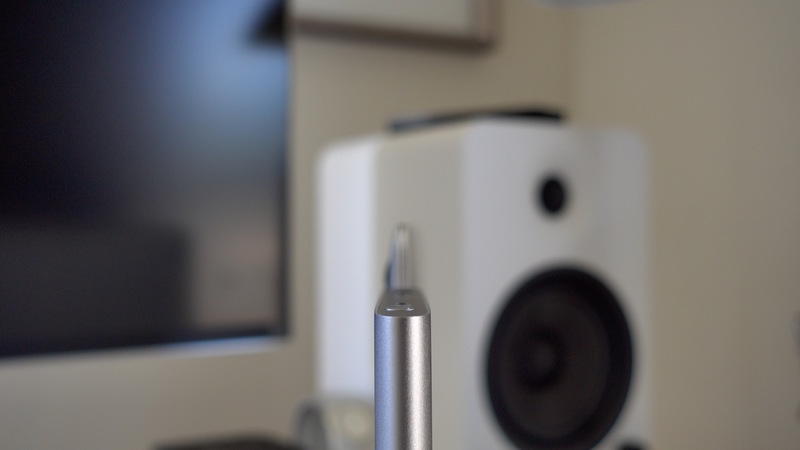 I wish that Kanex would have opted for a more granular power level readout instead of the traditional four LED setup. For a battery of this capacity, four LEDs don’t do a good enough job of accurately portraying how much actual battery life remains. A really nice feature of this battery is that operating it with your Mac doesn’t require you to turn the unit on or off. Once it detects a connection, charging begins automatically. You can press and hold the power button to disable charging if you wish to do so. As I noted at the outset, this is a beautifully designed product. The entire battery is housed in aluminum and feels solid. The GoPower USB-C is fairly thin, but to accommodate its 15,000 mAh battery, it features a wider surface area than many of the portable batteries you may be familiar with. 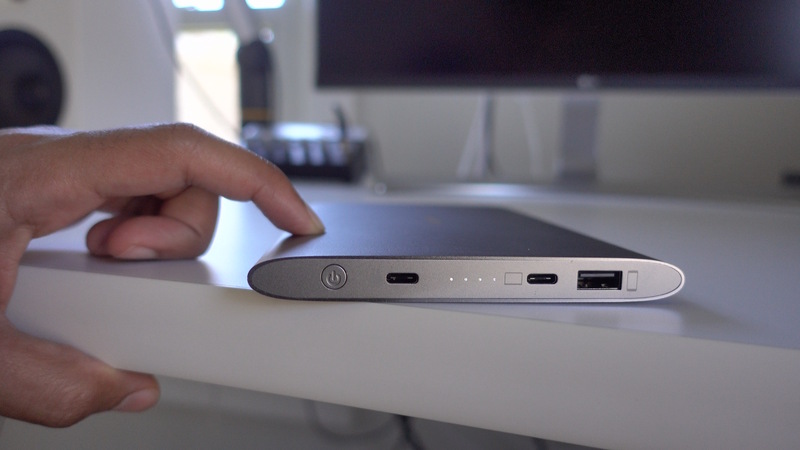 At its thickest spot, the GoPower USB-C is slightly thicker than a 12″ MacBook’s thickest spot with its lid closed. Ultimately, the design means that you’re not going to be able to slide it into your pocket, but its thinness allows it to slip into a portfolio or carrying case without feeling too bulky. The Kanex GoPower USB-C, with its 15W USB-C output (5.0V x 3A), is theoretically capable of charging the MacBook somewhere in the ballpark of half the speed of Apple’s 29W adapter, but real world speeds fall below that. In other words, don’t expect to break any charging speed records. In my tests, charging performed best when the MacBook’s lid was closed or when the MacBook was powered down. This is no surprise, since using the machine requires power while in use. I used coconutBattery to provide me with additional statistics about the battery and charging state. 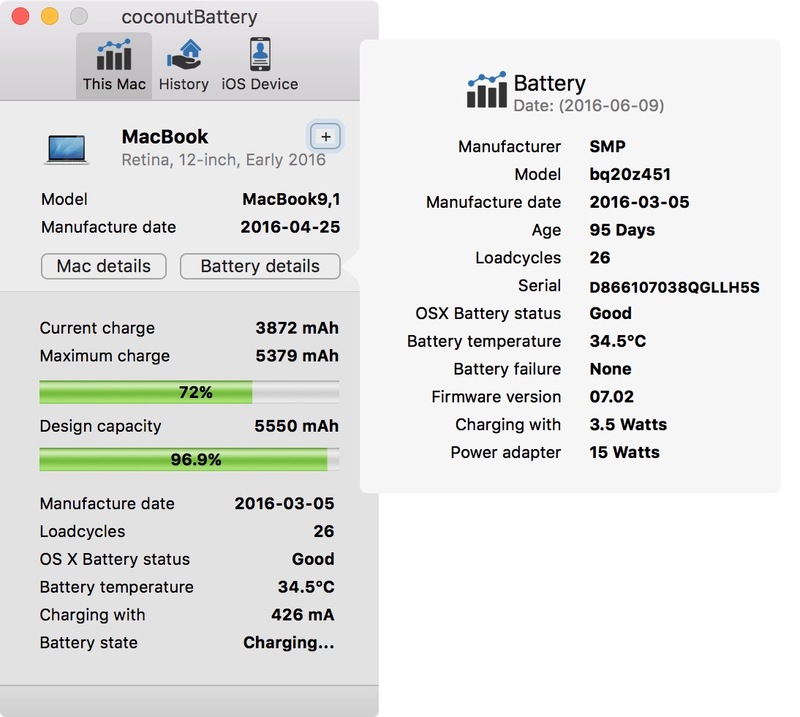 As you can see from the coconutBattery readout, my MacBook battery’s maximum charge capacity is 5,379 mAh. The MacBook’s current charge when tested was at 3,852 mAh. Subtract 3,872 mAh from 5,379 mAh, the max battery capacity, and you get 1,507 mAh. Divide 1,507 mAh, the amount left to fully charge the battery, by the amount of power being supplied to the MacBook via the GoPower USB-C. In this case, it’s 3.4W or 413mAh. 1,507/413 = 3.65. This number, 3.65, should be somewhere in the ballpark of the Mac’s estimated time until full. As we can see from the figure below, it’s relatively close. What can we learn from this? Even though the GoPower USB-C features a 15W USB-C output (5.0V x 3A), you’re obviously not going to get the full 15W when charging your MacBook. I think the highest wattage I saw was somewhere around 6.7W. That means that charging your MacBook with this battery pack will be less than half as slow as charging your MacBook with its pack-in adapter. To be fair, the MacBook’s 29W charger isn’t 100% efficient either. I generally saw about 19-20W of power being supplied to my MacBook at any given time. I guess what I’m getting at is that you shouldn’t expect this battery to work as a power adapter replacement. It’s good for slowly charging while your MacBook is in use, but if you’re looking to recharge quickly, using Apple’s 29W adapter is best. If you’re looking for a way to supply your MacBook with power while away from the power outlet, then you have a brand new option worth considering. Perhaps more importantly, the GoPower USB-C has been tested with the 2016 MacBook, which as Jordan highlighted, isn’t necessarily the case with every USB-C-enabled battery pack. One of the best features of the 12″ MacBook is its ability to take advantage of external battery packs without any tricks, special equipment or workarounds. It certainly won’t replace your power adapter, but if you’re someone who often travels and works on the go, then Kanex’s $99 GoPower USB-C is worth considering.